Party invitation for Sunday at 1:30 p.m. How perfectly civilized and highly unusual. No need to suffer from the Sunday night "We ate too much at the party but are still a little hungry" blues. We were able to have lunch first and be in perfectly good spirits, eat cake and sweets at snack time and still have room for a real dinner. Parents (me too!) take note..this is a great time for a party. AND you don't even need to serve copious amounts of food (which today's gracious hosts did..there was wonderful-looking pizza and penne but Izzy and I did not partake as we were still full from lunch). 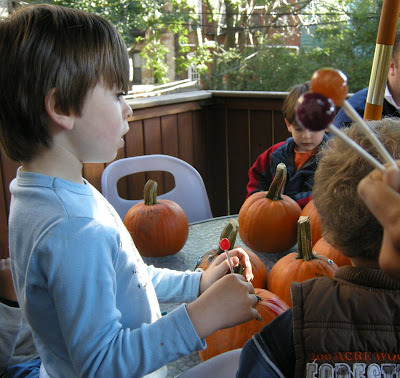 The party was centered around a rollicking puppet show, with time for pumpkin decorating and pinata piercing. The highlight for Izzy (and others)was the pinata. He scooped up handfuls of candy, grabbing more than enough to keep a few dentists in business. Later on he requested an "empanada" at his own party. Now you know how much I adore these things, which always seem to bring out the best in the little guests. But today something seemed different. The children were less frenzied..perhaps a result of the good timing of it all? Could I actually stomach the idea of a pinata at Izzy's party? Well might be able to manage since I discovered that I could actually fill the pinata with goodies of our choosing. The idea seems more appealing than I had previously imagined. Organic lollipops? Fair trade chocolate..anything is possible.